The Terex Finlay I-140 direct drive ø1270mm x 1240mm (Ø50” x 48”) horizontal impact crusher with variable speed gives operators unprecedented levels of production in both recycling, mining and quarrying applications. The robust and proven Terex CR032 chamber gives excellent reduction ratios and high consistency of product shape. A significant engineering approach being introduced in this model is the material flow through the plant. The flow of material has been significantly improved by increasing the width of components as the material moves through the machine. The machine features an advanced electronic control system that monitors and controls the speed of the rotor and regulates the heavy duty vibrating feeder (VGF) with integrated pre-screen to maintain a consistent feed of material into the impact chamber for optimal crushing conditions. Material from the integrated pre-screen can be diverted to a stock pile via the optional by-pass conveyor, or it may join the crushed product on the main belt. 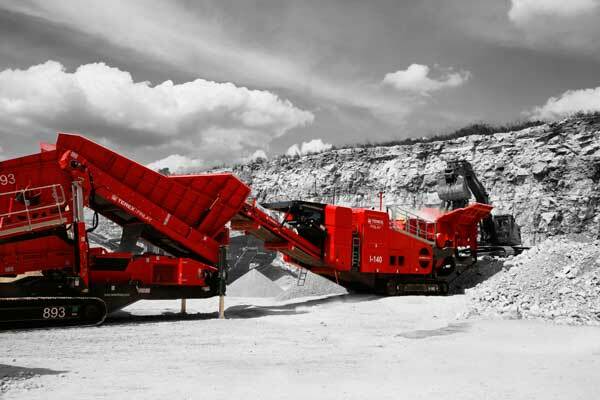 The standard hopper capacity of 6m³ (7.5yd³) places the machine at the forefront in this competitive market sector. “The introduction of the Terex Finlay I-140 represents a significant step change in our family of impact crushers. Our field test results of extensive testing have recorded significant productivity increases depending on the application, over the model that it replaces. The enhanced material flow process of the plant represents a significant step change to our engineering ethos and in due course will be extended to encompass our range of impact crushers” said Alan Witherow, Product Manager. •	The ease of material flow through the machine has greatly improved with each component of the machine increasing in width as the material moves through the machine. •	Fully hydraulic apron setting assist provides convenient and efficient adjustment of the aprons. •	Heavy duty vibrating feeder (VGF) with integrated prescreen removes dirt fines and sizes bypass material for reprocessing. •	Optional under crusher vibratory plate feeder with wear resistant liners aids material discharge flow.